Nondestructive testing (NDT) are noninvasive techniques to determine the integrity of a material, component or structure or quantitatively measure some characteristic of an object. In contrast to destructive testing, NDT is an assessment without doing harm, stress or destroying the test object. The destruction of the test object usually makes destructive testing more costly and it is also inappropriate in many circumstances. NDT is used in a wide range of industrial areas and is used at almost any stage in the production or life cycle of many components. NDT of welds is one of the most used applications. It is very difficult to weld or mold a solid object that has no risk of breaking in service, so testing at manufacture and during use is often essential. Personnel Qualification is an important aspect of non-destructive evaluation. 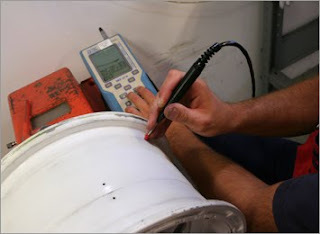 NDT techniques rely heavily on human skill and knowledge for the correct assessment and interpretation of test results. Proper and adequate training and certification of NDT personnel is therefore a must to ensure that the capabilities of the techniques are fully exploited. There are a number of published international and regional standards covering the certification of competence of personnel. The EN 473 (Qualification and certification of NDT personnel - General Principles) was developed specifically for the European Union for which the SNT-TC-1A is the American equivalent. 4)Acoustic Emission (AE or AET). Besides the main NDT methods a lot of other NDT techniques are available, such as Shearography Holography, Microwave and many more and new methods are being constantly researched and developed. 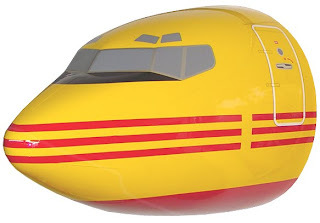 Detection of surface detects or structural damage in all materials of aircraft. Fluorescent penetrants are used in critical areas for more sensitive evaluation. Simple in principle, easily portable. Fast and effective for surface & subsurface defects in ferromagnetic materials of any shape, removed from engines, pumps, landing gear, gear boxes, shafts, shock struts etc. Widely used for bolts inspection. Eddy current test is used to detect surface & subsurface defects, corrosion in aircraft structures, fastener holes and bolt holes. Surface detects and conductivity testing by high frequency and sub-surface detects by low frequency methods. Considering the penetration and absorption capability of x-radiation, radiography is used to inspect a variety of nonmetallic parts; for porosity, water entrapment, crushed core, cracks and resin rich/straved conditions; and metallic products; such as welds, castings and forging as well as locating discontinuities in fabricated structural assemblies such as cracks, corrosion, inclusions, debris, loose fittings, rivets, out of round holes & thickness variations. 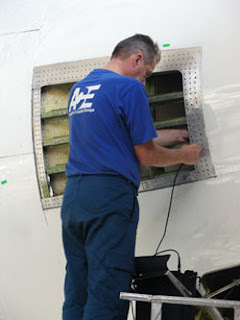 Gamma ray radiography is usually used for detection of internal flaws of aircraft structure (steel & titanium) and engine components which require higher energy levels or other assemblies where access is difficult. Detection of surface defects or structural damage in all materials. Optical instruments are used for visual checks of internal areas and for deep holes and bores of aircraft structure, landing gears etc. Widely used to monitor engine components, such as, turbine wheels and nozzles, compressor vanes and blades combustion cans without opening the engine. 'Borescopes', 'fibrescopes' and 'video imagescopes' are most important optical aids in remote - visual inspection, which area is normally inaccessible. To examine bonding exists between honeycomb, detect delaminations in composite laminates. 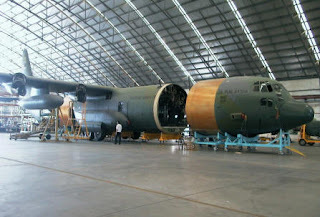 Large structures such as, fairings, cowl and wing trailing edge, rudder, flaps, ailerons, elevators etc. are made from composites and honeycomb materials. thermal overheating in electrical & hydraulic system. (ii) Composite sandwich parts - for debonding and liquid contamination. (iii) Metallic bonded parts - for debonding of corrosion on. (iv) Metallic sandwich parts - for liquid contamination, debonding of corrosion.